Wujra Soochi or refutation of the arguments upon which the Brahminical institution of caste is founded / by the learned Boodhist Ashwa-Ghoshu. Aslo the Tunku by Soobajee Bapoo, being a reply to the Wujra Soochi. - [S.l., Bhopal?] : [s.n. ], 1839. 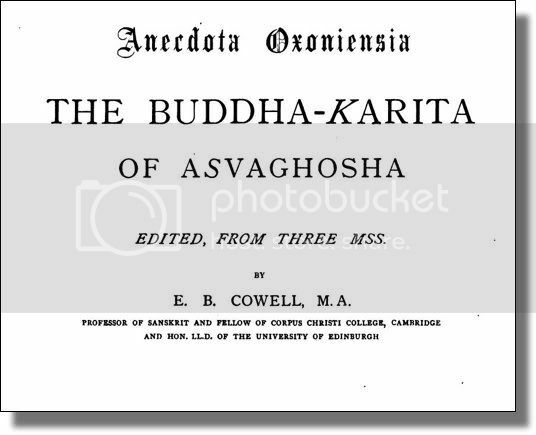 - 13, 60 S.
The Buddha-Karita of Asvaghosha / ed., from three mss. by E. B. Cowell. - Oxford : Clarendon Press, 1893. - xv, 175 S. - (Anecdota Oxoniensia).